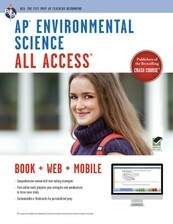 This book, and the online tools that come with it, will help you personalize your AP® Environmental Science prep by testing your understanding, pinpointing your weaknesses, and delivering flashcard study materials unique to you. Study the topics tested on the AP® Environmental Science exam and learn proven AP® strategies that will help you tackle any question you may see on test day. As you review the book, test yourself with 7 end-of-chapter quizzes, plus 2 mini-tests. Score reports from your free online tests and quizzes give you a fast way to pinpoint what you really know and what you should spend more time studying. Armed with your score reports, you can personalize your study plan. Review the parts of the book where you are weakest, and use the REA Study Center to create your own unique AP® Environmental Science e-flashcards, adding to the 100 free cards included with this book. Two online mini-tests cover what you've studied in each half of the book. These tests are like the actual AP® Environmental Science exam, only shorter, and will help you evaluate your overall understanding of the subject. After you've finished reviewing the book, take our full-length AP® Environmental Science exam to practice under test-day conditions. Available both in the book and online, this test gives you the most complete picture of your strengths and weaknesses. We strongly recommend that you take the online version of the exam for the added benefits of timed testing, automatic scoring, and a detailed score report. With your score reports from the quizzes and tests, you'll be able to see exactly which AP® Environmental Science topics you need to review. Use this information to create your own flashcards for the areas where you are weak. And, because you will create these flashcards through the REA Study Center, you'll be able to access them from any computer or smartphone. Not quite sure what to put on your flashcards? Start with the 100 free cards included when you buy this book.